Errol: I sometimes wonder why people don’t tell me their feelings. Actually, that’s not true, I don’t wonder at all. 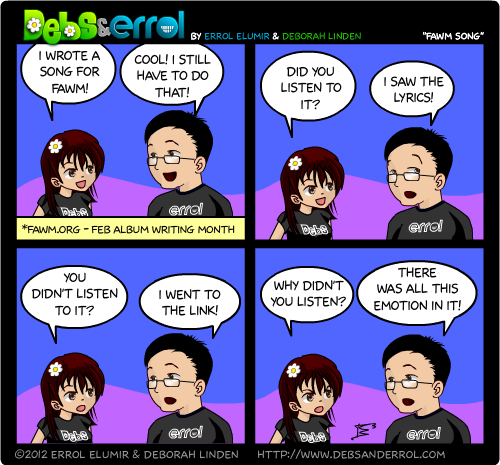 Errol, you should at least listen to the song. And maybe post a link. Because mentioning something and then forcing me to dig through updates and statuses to find a song is mean. Debs, great song! One down, thirteen to go. Which, is still one more than Errol has done, so that is always fun. Errol you should listen to it, if only for the sake of fawming good habits. @Errol, All the more reason to start work on some good ones, before it is too late. Ohhh Errol. Talking up a good game about FAWM and then not even listening to songs :P.
@Manda, I think he has invented meta-FAWMing. @Phil Mills, Or procrastinating. I’m the patron saint.